WASHINGTON - House of Representatives Speaker John Boehner, facing a Republican revolt by tea party conservatives amid revelations that his debt-ceiling plan would not cut as much spending as advertised, was forced to delay a vote on legislation just a week before an Aug. 2 deadline for staving off the potential financial chaos of America's first-ever default. Even with time running out and the Treasury's ability to pay the nation's bills at stake, the speaker promised to quickly rewrite his legislation to increase the U.S. debt limit after budget officials said its planned spending cuts didn't add up. Many analysts have predicted dire consequences for the U.S. and global economies if the United States defaults. Credit rating agencies have threatened to downgrade the United States' gold-plated AAA rating if Congress and the White House don't extend the debt ceiling and take steps to bring long-term deficits under control. Congressional veterans say a final-hour bargain can't be reached until both parties prove that neither the Democrats' top goals nor the Republicans' can be reached in the divided Congress. While Democrats have apparently dropped their demand for tax increases for the wealthy, the main sticking point remains how many trillions of dollars to cut in exchange for a critical increase in the government's $14.3 trillion debt limit. An official congressional analysis late Tuesday said that Boehner's plan would produce smaller savings than originally promised - less than $1 trillion in spending cuts over the coming decade rather than the $1.2 trillion he estimated on Monday. While Boehner searched for votes within House Republican ranks, some Americans seemed to edge closer to the notion that the Aug. 2 deadline might pass without a solution. The stock market fell again, although not dramatically. Public clashing between Democratic President Barack Obama and the Republicans showed no sign of easing. The White House declared Obama would veto the Republican bill, even if it somehow got through the House and the Democratic-controlled Senate. After all that, it was the conservative tea party-backed members of Boehner's own party who continued to vex him, and heavily influence the debt and deficit negotiating terms. Their adamant opposition to any tax increases forced Boehner to back away from a "grand bargain" with Obama that might have made dramatic cuts in government spending - including big benefit programs long protected by Democrats - with some revenue increases. Yet when Boehner turned this week to a more modest cost-cutting plan, with none of the tax hikes that Democrats had demanded, many conservatives balked again. They said the proposal lacked strict measures like a constitutional mandate for balanced budgets. For seven months, tea party-backed House members - newcomers and veterans alike - have rewritten congressional traditions. House Speakers can normally offer favors and issue veiled threats to round up the needed support on tough votes. It's possible Boehner will be able to do so on the debt-ceiling matter. But many tea party activists abhor political compromise. They insist that their elected officials stand on principle, regardless of the consequences. Rep. Jim Jordan, chairman of a large group of conservative House Republicans, sent a tremor through the Congress Tuesday when he said he doubted Boehner had enough support to pass his plan. Boehner wasn't helped when Republican presidential candidate Tim Pawlenty and the groups Tea Party Patriots, Tea Party Express, and the conservative business group Club for Growth criticized his plan. 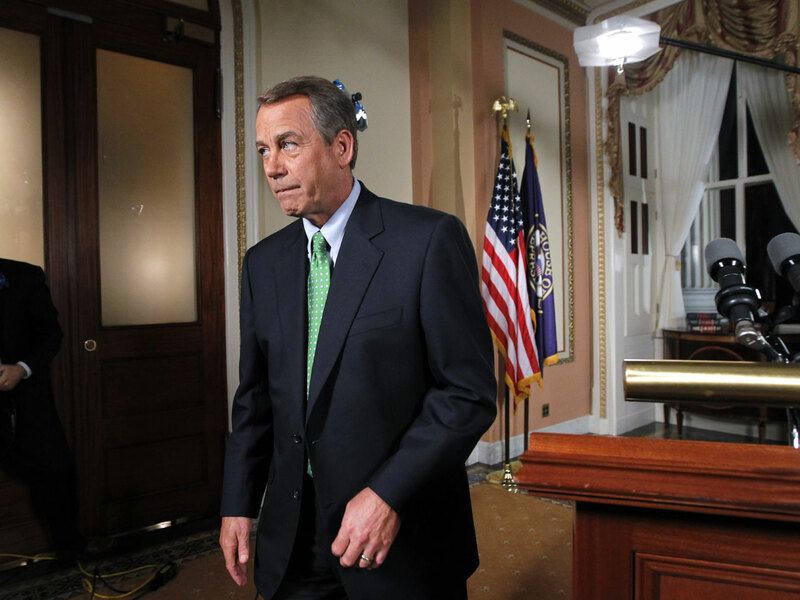 The House vote on Boehner's plan originally scheduled for Wednesday is now set for Thursday. That may give Boehner more time to hunt for votes, but it gives Congress and the White House even less time for maneuvering. The Boehner bill would require congressional action to raise the debt ceiling this summer, and again before the 2012 elections. Obama strongly opposes that last requirement, arguing that it would reopen the delicate and crucial debt discussions to unending political pressure during next year's presidential and congressional election campaigns. The president supports a separate bill, pushed by Majority Leader Harry Reid in the Senate, that would raise the debt ceiling enough to tide the government over through next year - and the elections. Reid's plan, like Boehner's, would also identify about $1.2 trillion of spending cuts to the day-to-day operating budgets of government agencies. Reid's proposal, however, would require only one congressional vote to raise the debt ceiling before the 2012 elections. And it counts an extra $1 trillion in savings from winding down the wars in Iraq and Afghanistan, savings that critics say would have occurred anyway. Despite calling for a "balanced plan," Obama effectively jettisoned that goal this week when the White House announced he backed an approach by Reid that calls for no tax increases to reduce deficits. Some private economists are suggesting the Treasury may have enough money on hand to pay the government's bills for another two weeks beyond an early August deadline for Congress to raise the debt ceiling. But the Obama administration insisted on Tuesday that it will run out of maneuvering room after Aug. 2.